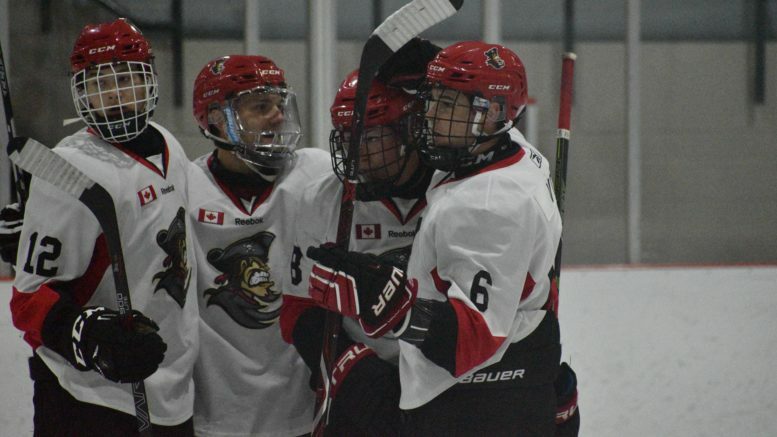 After dropping the season opener 8-2 to the Raiders in Napanee on Sept. 14, the Picton Pirates were eager to assert themselves and show they were better than the lopsided score they found themselves on the wrong side of. Well, this weekend proved the Pirates are a talented club that is still working the kinks out the early days the 2018-2019 PJHL schedule. Not that they needed validation. A pair of decisive home wins followed by a road loss on Sunday afternoon that came just over 12 hours after the previous evening’s game produced four out of a possible six points for Picton and gets them on their way to grind of a lengthy and wandering regular season schedule. Picton (2-2-0) dropped the Campbellford Rebels 6-0 in the home opener Thursday and then thawed the visiting Georgina Ice 6-2 Saturday night. 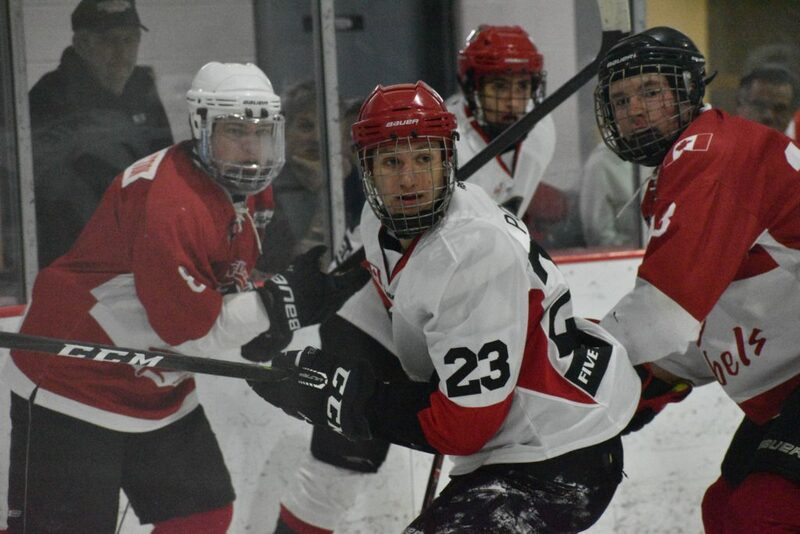 But just as the Ice had bus legs and the Pirates took advantage of their Orr Division opponents on Saturday night, Picton was dealt the same hand on Sunday afternoon as it took the locals a period to get up to speed with the host Port Perry MoJacks. The Pirates would ultimately fall 5-2 to the Orr Division squad in Picton’s first game in Port Perry since the 2011 Schmalz Cup quarterfinals. After not capitalizing early in Napanee and having the game get turned on them, Picton dominated the visiting Rebels from the opening puck drop on Thursday. Outshooting Campbellford 19-5 in the first, Picton managed a 2-0 lead after 20 minutes thanks to Griffen Conger’s first as a Pirate and a Noah Brant power-play marker. In the second, Picton continued to exact a physical toll on the Rebels and scored three goals but could have easily had six as a goal was washed out due to Devin Morrison directing the puck in with his skate and the Bucs hitting a pair of posts. Logan White slipped a puck past Alex Ward at 6:56 to make it 3-0 Picton. That lead was extended when Conger bagged his second of the game and the season at 14:05 and then Tristan Cowan’s first junior hockey goal at 15:48 made it 5-0. Consecon native Matt Poole finalized the scoring early in the third as he took a Tye Eaton feed and potted his third of the season. Later in the third, the game was halted for a short period of time when Campbellford winger Kyle Deline attempted to put a hit on hulking Nate Boomhower who was picking up steam behind the net. Deline went down hard and the training staff attended to the Trenton native for some time. 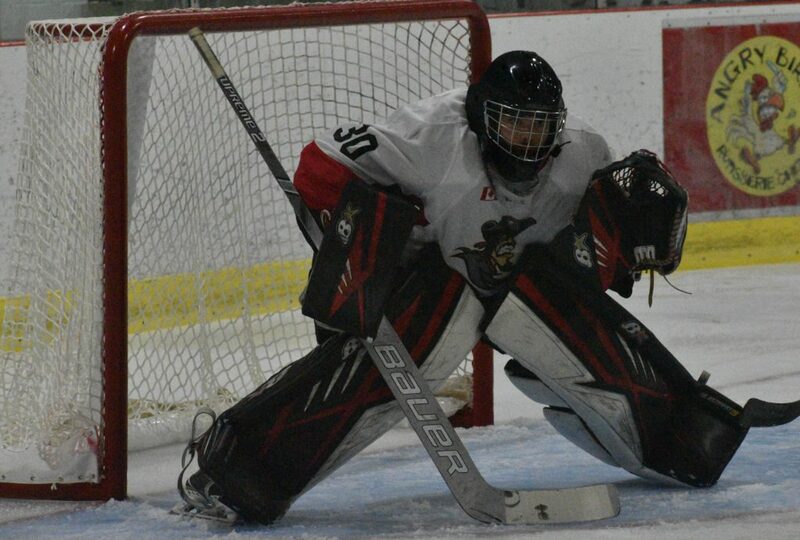 Picton starter Brennan Bush stopped all 17 Rebels shots sent his way for his first junior hockey win and shutout. Green said his side came out hungry, looking to both shake off a loss and impress the hometown faithful in the first home game of the season. While Boomhower’s size and strength is evident to anyone watching, Picton might have some other top end pieces in the form of White and Poole. The forwards have combined for eight goals in four games and are showing game-breaker capabilities early. 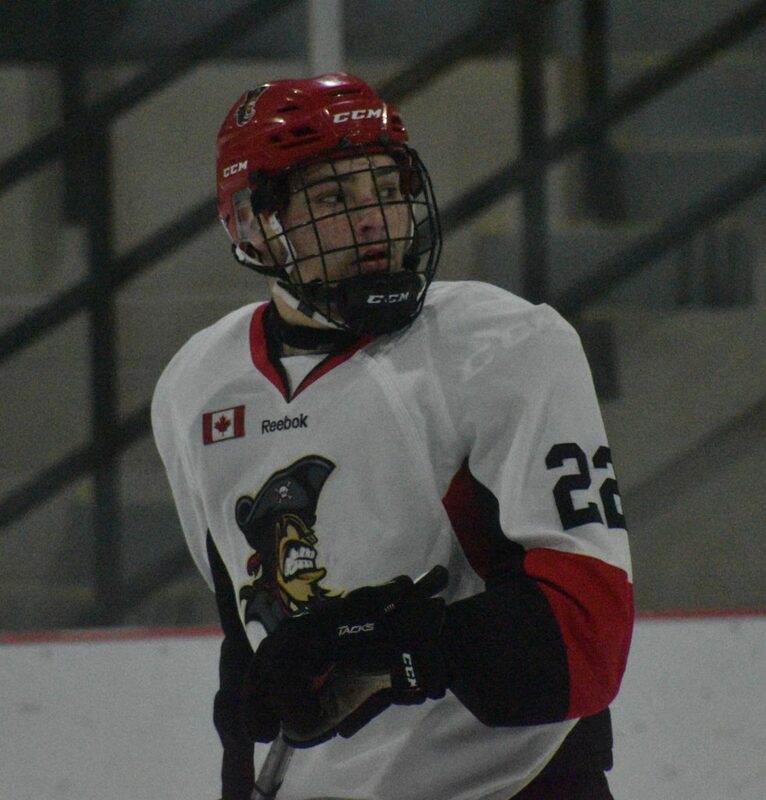 White’s nose for the net was evident two nights later as the Pirates welcomed a hockey team from Georgina to the Huff Estates Arena for the first time since 2005. The Ice seemed frozen in the first as Picton shot out to a 4-0 lead thanks to a pair of special teams goals by White. After Will Harrison turned in some great work in the corner in the Georgina zone and spotted Landon McLellan for at shorthanded marker at 4:33, Morrison set up a streaking White for a breakaway chance under a minute later. White, showing deft skill, deked Abramo Ginevra to make it a 2-0 Picton lead. A little later in the frame, Cole St. Pierre set up Conger for Picton’s third of the night and then White’s second of the game came on the powerplay at 14:04 of the first and chased Ginevra in favour of Alex Surzycia. Georgina’s Brad Boudreau would score under a minute later to get the Ice back in formation but Picton escaped with a 4-1 lead. Green added he warned his club not to get complacent after a successful first period and told his charges the next goal was crucial. “The guys were comfortable and if they scored the next one, it could change the outlook on the game,” Green said. Georgina would get the next goal thanks to a Nate Watson power-play marker at 8:23 but, showing poise, the Pirates were able to have a quick reset and start peppering the Ice net with pucks. Picton would restore the three- goal lead on the power play when Cooper Rogers and Landon McLellan set up Harrison for his first of the campaign at 13:38. At the close of the second, Picton was outshooting the Ice 41-14. In the third, Picton’s Owen Dever would score late of a nice feed from Jack Dow to make the final 6-2. Kyle McNair picked up his first junior win, stopping 23 Ice shots. After a Saturday night game that saw the players leaving the rink just before 10 p.m., the Pirates were on a bus headed for Port Perry the next morning and played like they had travelled a long way to play their first regular season game in cottage country since the old Empire league had an interlocking schedule with the Central Ontario loop back in 2005-2006. Port Perry’s Derek Risebrough scored early to put the hosts up 1-0 in the opening two minutes but Picton was able to respond at 7:29 as White converted a Harrison feed. In the second, Picton was able to get their legs underneath them and outshot the Mojacks 17-12 but it was Port Perry who went ahead on a Carter Thornton goal. “We were getting chances but we had no finish and when they were able to find corners, we were finding the goalie or the posts,” Green lamented. Thornton’s second of the game 6:44 into the third was enough to seal it for Port Perry. After the Mojacks made it 4-1, White would convert on the powerplay at 14:36 to get Picton to within two goals but an early pull of Picton starter Bush by Green proved to be costly at the Mojacks scored an empty netter with just over two minutes left to salt the game away at 5-2. Picton takes a rare Thursday night off and then hosts the defending Schmalz Cup champion Lakefield Chiefs on Saturday night starting at 7:30 p.m.
“It should provide us a really good test of where we are and I know the players hope to see a really big crowd on hand,” Green said.